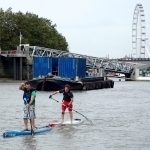 SB/ How did you come up with the idea of the Big Ben SUP Challenge? 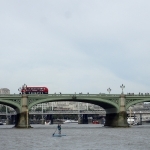 Since starting Active 360 in 2011 I had always thought a race into central London would be a great way to showcase SUP. 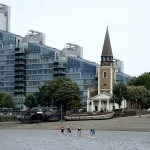 The sport has been restricted on the Thames since 2010 when the Port of London Authority (PLA) got jittery about a new growing watersport which to them looked dangerous. 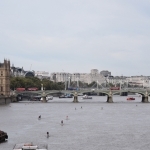 First a restriction was applied to prevent SUP upriver of Vauxhall Bridge and in 2013 a further restriction to limit SUP to the river above Putney Bridge. I’ll explain in more detail in my next article how we tackled the restrictions and proved the sport was one of the safest watersports. 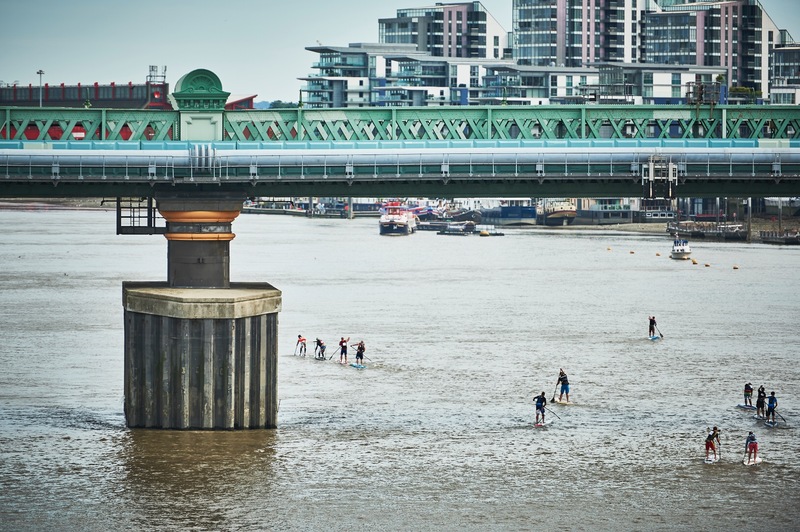 In 2015 we started working on the idea of a source to sea SUP relay on the Thames and a race into London seemed a natural part of this. The Relay involved many months of planning including risk assessments and work with the PLA. Managed by a small team led by Melanie Joe who in 2015 paddled the whole length or the river we aimed to draw attention to the river damage being caused by plastic pollution. SB/ How did you decide on the route and number of competitors? A one way 10km race from Putney to Big Ben seemed ideal but after consultation with brands and people involved in racing a two way 20km race over that course seemed more attractive to racers and logistically easier. So the Big Ben Challenge idea was born. The Big Ben Challenge turning point was at the Worlds most famous clock tower and the start and finish point at the start of the World famous Boat Race. The PLA were nervous and wanted the first event to be small to demonstrate how SUP racing could be organised safely on this busy stretch of river with strong currents. So this restricted the number of competitors for the 2016 race. SB/ Who else was involved in the planning? We were already discussing sponsorship of the Thames Relay with Tideway the engineering company building London’s Super Sewer so we added this to the mix. They liked it and agreed to fund prizes and a contribution to safety costs. Rob Crookall, a local racer helped with recruiting participants and racer Bryce Dyer helped us to decide which applicants would be able to complete the distance in a similar time based on recent results. SUPboarder mag did a great job in getting the word out to the racing community. Interest in the race was strong even though we advertised only a few months before the event. So now we had a race course, a sponsor and competitors. SB/ How did you feel prior to the event? The race day arrived and even after so much careful planning we had a few worries about whether racers would enjoy the course. After all it’s very different from almost any other race. An urban course on a tidal stretch of river with a huge tidal range. 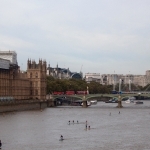 The Thames is generally a clean river, although prone to episodes of pollution after heavy rainfall (something the Tideway Tunnel will greatly reduce). However the clay substrate make the river muddy and dirty looking – the ‘dirty old river’ in the song Waterloo Sunset. Plastic pollution – which is now almost everywhere – adds to the bad impression. However, what the Thames lacks in clean good looks it more than makes up for in history. More history has been made on its banks than almost any other river. It has been lived on or near since prehistory and has many iconic landmarks on or near its shores. 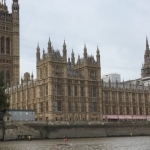 SB/ How did the first Big Ben SUP race go? We started the race on time which turned out to be an additional challenge for competitors when the tidal predictions were wrong by close to one hour. This meant that the fastest racers battled back against tide and wind. The first half at least was with tide and wind and was very quick. Most racers stayed close together for 5km although by the turn point the field had broken up into several groups. I won’t go into details of the race here as it’s already been reported much better than I could by racers including Crispin Jones, Ben Pye and Furio Vitali who all wrote first class accounts from a competitors perspective. SB/ What does the future hold for the Big Ben Challenge? The PLA had no complaints about safety and one of their patrol boats kept an eye on proceedings. We are in discussions about a race in 2017 which could see 50-80 competitors. Also we will consider the potential for an additional shorter race course which would appeal to racers outside of the elite pool. The pilot has paved the way for a much bigger race event that could one day have hundreds competing from across the World. This is a great credit to everyone who helped make it happen and they should be proud of their part of making history. 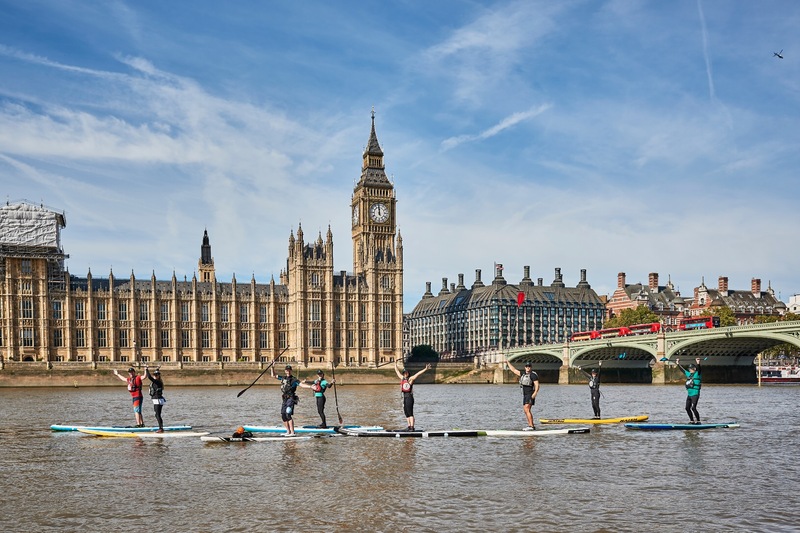 The likely date for the 2017 Big Ben SUP Challenge is Sat 23th Sept. Start time approx 10:30am. So get it in the diary and be part of something BIG alongside Big Ben!